It's been a while since I've interrupted the nonsense by posting pictures of anything I've made, and even longer since I've made anything, so here's a footstool that hopefully will be the prototype for a future generation of them. Of course in what is something of a tradition, it's been finished for a year or two, but not much has happened since. There is one under construction now, which was to be a first birthday present for our grandson, but it looks as though it might have to be for his second now, since he snuck his birthday in last year some time when we were looking in the other direction.. It is fascinating for me (even if not for anyone else) to reflect on how even something as simple as these stools represents a documentation of change in half a century of history and in the way we live our lives. We can observe in them a progressive increase in disposable wealth and as a result of a corresponding decrease in manufacturing costs better tools have become available. Cheaper manufacturing has eliminated the need to rescue second hand nails, but at the same time there is reference to a diminution of materials, as useful timber becomes more difficult to obtain, and certainly it is difficult to find a usable quality in modern packing crates. Of course the family genetic predisposition to scrounging has not devolved, a fact which Darwin may have been able to draw some conclusive thesis from, but few others . 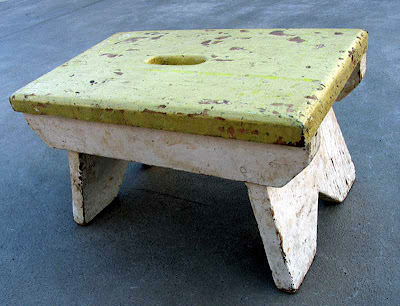 The first of these stools has been around as long as I can remember. It was built by my father and his dad about the time I was beginning to walk, midway through last century. Three of them were built from packing case timber and nails recovered and straightened before re-use. (Scrounging is an art handed down from generation to generation in my family!). With the advent of machine driven nails, it is difficult if not impossible to reuse nails today. Paint was left overs, courtesy of the Commonwealth Government house we lived in the fifites which explains some "interestingness" in the colour tones of one or two of the stools. Tools were rudimentary, in those days the timber was plentiful, so it is over an inch thick and the top is one piece although the construction is about as crude as can be, it's held together with those two inch former packing case nails and nothing else. The legs have been simply checked over the stretchers. Dimensions are 240 x 350 x 180 high, and the slope of the legs is such that the overhang never causes a problem with small children standing on one end. 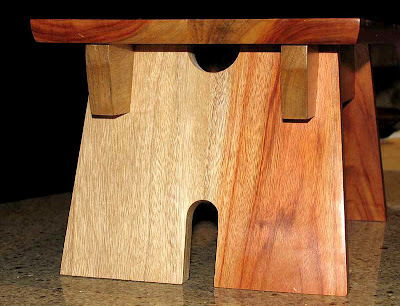 All in all it's a perfect stool for kids to stand on to reach handbasins, kitchen sinks etc, or to sit on for other activities, and great for grown-ups to stand on to reach the top shelf, a simple utilitarian and very effective piece of furniture. 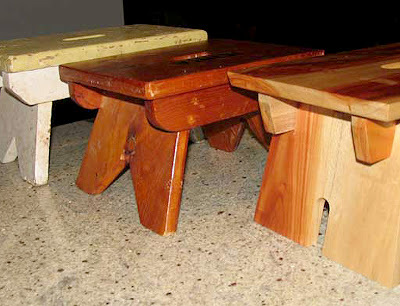 The second stool is one of nine built by my dad for each of his grandchildren as they got to be mobile. The utility remains of course as they are an almost exact copy of the earlier version. 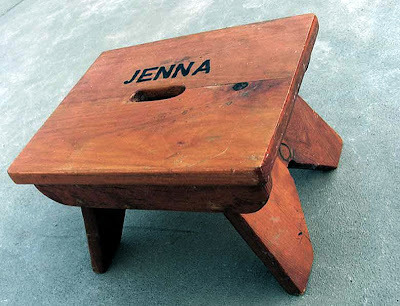 An edition of this stool was made sometime in the first year of each of his nine grandchildren's lives (from 1978-88), in time for them to stand at the basin to clean their teeth! Each was finished with polyurethene, and the name of it's owner carefully (but shakily) painted in black on the top. At the time he was suffering from a few ills, and although he had a few more tools which made the job easier, materials were more difficult to scrounge. Packing case pine was free and still the best choice, but it was no longer dressed on the crate, this one was cleaned up with a belt sander to make it a little more presentable. The timber was thinner, about 18mm and had to be joined from two widths. Probably because of the lack of thickness, but also because he wanted concealed fixings throught the top, he built a triangular cleat and used some scrounged screws (8 screws- 3 different sizes) to fix it all together. Dad could spot a screw in the middle of a six lane highway at twenty paces! Finally my own version, a tribute to the other two, just as simple and similar in dimensions but with more sophisticated detail in the construction. I'd been pondering how to go about my own interpretation of these stools for some time. I wanted to devise a structure which would not require mechanical fixings (I'm not quite as adept at finding screws), yet keep the same proportions, and here is the result. Five pieces interlocking, the legs slide over the stretchers and through the mortices in the top where they are wedged. The whole structure is self supporting, and doesn't need any mechanical fixing. Dimensions of all are similar, in this case the construction material is scraps of Camphor Laurel pulled out of a New Year's bonfire, and of course I didn't have to scrounge any screws or straighten any nails. Finish is sprayed satin NC lacquer. With a little bit of luck, what is the chance that one of my grandchildren will be able to write about the fourth or fifth evolution of this stool fifty years from now! Does that mean one of your girlies has to design and build one of these for their own grandchild?